Hellespont Alhambra is the first of the series of four new ultra-high spec double hull ULCCs delivered to Piraeus, Greece-based Hellespont Group. At the beginning of February, the 442.000-dwt ship immediately demonstrated its flexibility and economy of scale, delivering a full cargo of Middle East crude to Rotterdam, following a swift voyage from the Middle East Gulf to Europe via the Suez Canal. Alex Papachristidis-Bove. president and co-chartering manager of Seatramp Tankers, Hellespont's commercial management, said "It's exciting to come up with innovative solutions, successfully execute them for our clients, and know that we provide a unique service that is appreciated. The quality of design and build of these ships, their structural soundness, and the high quality of the hand-picked crew allow us to do these voyages. 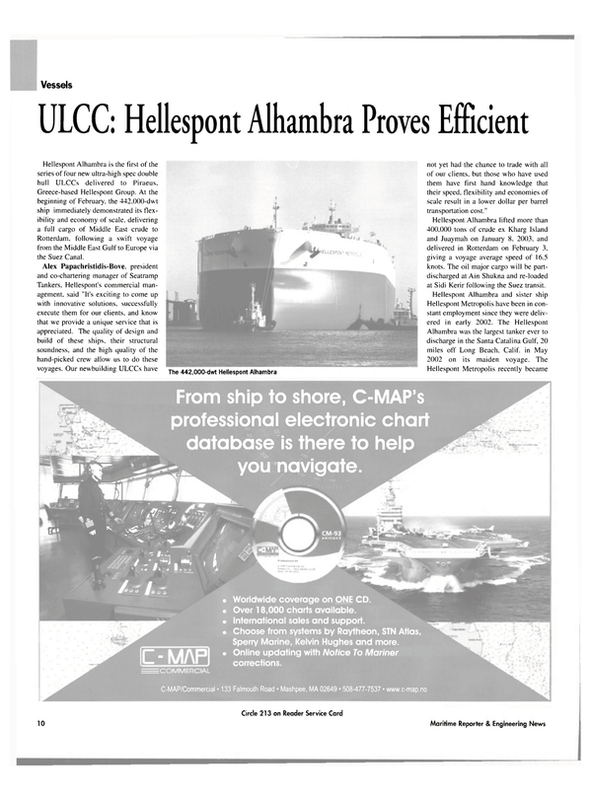 Our newbuilding ULCCs have not yet had the chance to trade with all of our clients, but those who have used them have first hand knowledge that their speed, flexibility and economies of scale result in a lower dollar per barrel transportation cost." Hellespont Alhambra lifted more than 400.000 tons of crude ex Kharg Island and Juaymah on January 8, 2003, and delivered in Rotterdam on February 3, giving a voyage average speed of 16.5 knots. The oil major cargo will be partdischarged at Ain Shukna and re-loaded at Sidi Kerir following the Suez transit. Hellespont Alhambra and sister ship Hellespont Metropolis have been in constant employment since they were delivered in early 2002. The Hellespont Alhambra was the largest tanker ever to discharge in the Santa Catalina Gulf, 20 miles off Long Beach, Calif, in May 2002 on its maiden voyage. The Hellespont Metropolis recently became the first ULCC to lift a cargo of fuel oil in Rotterdam for delivery to Singapore. The vessels are single screw tankers with 21 cargo tanks including 2 Slop Tanks. The cargo tankers are three across with piping for three grades with double valve segregation. Each ship is double hull with watertight centerline longitudinal bulkhead in the double bottom. Extreme design Hog/Sag bending moments are 1.510.000/1.090,000,000 Tm. The ships are each built from less than 38 percent high tensile steel.